We arrived at 7am in Shenzen, a Chinese town on the border with Hong Kong and our entry point.The journey on the bus was awful I think we both managed about 2 hours sleep max, because of the bumpy road and the small space, Wayne could not even get his arms into the bunk. We met 2 American girls that were on our bus and they asked us the way to the border as there were no signs. We weren't sure where it was as we wanted to get to Shekou port and get a boat to HK.They decided to do this too and as we could not find the bus stop we decided to spilt a cab and get driven there.It was a lot further than I thought back on the highway for about 30 minutes but when we arrived the next ferry to Kowloon (where we wanted to go) was in 20 minutes.We crossed the Chinese border quickly and had our passports stamped ready for our entry in to Hong Kong.The crossing was a bit choppy but I am glad we did it as it was so easy and we did get some great views of the surrounding islands and the Hong Kong Skyline.We were dropped at the Chinese ferry terminal just up from the cruise liner terminal which made it easy to find the main road, Nathan Road, easily and quickly and had a dim sum breakfast.We went our separate ways and took a short walk to our hotel which was really easy to find.We checked in with a guy called Keith who took us to our room, when the booking form said cosy double I did not expect it to be quite as small as it was but at £18 per night it was cheap for HK standards and it was clean and tidy.That afternoon we just slept, when we got up we had to find a bookshop so Wayne could order Harry Potter for its release.The bookshop we found was called the Swindon Book Company!!! So we knew we had to order it from there.In the evening we thought we should check out the skyline so we headed to the star ferry terminal where we got loads of tourist information and had a great view of Hong Kong Island.At 8pm there was a symphony of lights show, this is where buildings on both sides of the harbour have flashing lights and lasers which perform to the music.It was really good and the area was really bustling.We walked back to the central area and had a lovely large selection of Chinese food in a Noodle and Dumpling house.We then headed to an Irish Bar for a drink while the Open Golf Championship was on the TV. Day 2 - I was left for Harry Potter we picked the book up just after the shop opened and got a takeaway breakfast so Wayne could get started straight away.I decided to go and have my nails done which cost the same as at home and they were pretty good.I got back and Wayne was still reading so I had a nap and then decided to have a look at the shops.I walked around the small boutiques in the street; the street we are staying has everything you could ever need.I then walked toward the Chinese Ferry Terminal and found Harbour City, a large shopping mall spread over about 5 floors.It is full of designer stores and high street shops such as Zara, there were also lots of eating areas. I was also surprised to see lots of cosmetic stores and also craft shops with handmade cards and paper.The mall was that big and went in lots of different directions that I ended up getting totally confused and lost, it took me about 20 minutes to find the way to an exit.I made it back to the hotel and Wayne was still reading.In the evening we headed back to see the symphony of lights show as on a Saturday evening they have a firework show to accompany the lights and the music it was excellent.Spaghetti House for tea, a chain with hundreds of outlets in Hong Kong, Wayne had a Lasagne and I had a Prawn Caesar salad. Then an early night so Wayne could finish reading Harry Potter which he did in the early hours! Day 3 - We took the upper deck of the star ferry to Hong Kong Island the ride only took about 5 mins and it was a beautiful sunny day. We walked along a raised walkway onto a shopping mall with lots of designer stores, but decided to get down to the ground and onto the pavement.As it was so hot we wanted to stay outside and we thought the best idea would be to head towards the parks.Once we were on street level we found it really difficult to get anywhere as it seems the whole city is connected by raised walkways which go in and out of offices and shopping centres and run alongside the road.We found Hong Kong Park up 2 sets of escalators from a shopping centre! !The park had a fountain which you could sit under and a lake with Koi Carp and lily pads it was just so peaceful in the middle of the city. The park also had a waterfall and an aviary which was massive and covered in netting so it felt like being outside with the birds.We then walked to the Zoological and botanic gardens which was an uphill climb and it was so hot, we only managed a quick walk around before heading for lunch and a drink.We took the ferry back to Kowloon, lower deck this time, it is slightly cheaper but the view is just as good!We found a cinema not far from our hotel and as it was so hot even in the early evening we thought it would be cooler to watch Harry Potter No 5 in air-conditioning, so we did and the film was pretty good. Day 4 - We woke late so our plans for Disneyland did not materialise. Instead we took the ferry to Lantau an island only 45 minutes away.We then took the bus from the dock to see the Big Buddha.The Buddha was only constructed in the 80's when the monks from Po Lin Monastery visited China and decided that they needed a Buddha near their monastery. The Buddha is amazing and we were very much in awe, the location is great with fantastic panoramic views over the island and out towards the sea, which is dotted with boats and small islands on the horizon. Inside the Buddha there is a museum dedicated to the history behind the construction and Buddhism, on our way out we were given an ice cream and bottle of water which was included in the entry fee. We walked down the steps and over to Po Lin Monastery where there were lots of incense sticks being burnt and in one of the temples the monks were praying and singing. This was totally mesmerising and we felt very lucky to have been able to watch.We were going to make our way to Tai O fishing village but the bus timetabled showed that we would only be able to spend about 10 minutes there so we decided to head back to the Mui Wo (the port).As the next boat back did not leave for over an hour, this was the perfect excuse to go to the beach at Mui Wo, known as Silvermine bay.Wayne had a swim and I paddled which was really refreshing.We headed back to the boat through the food market.Back on Hong Kong Island we jumped onto the open top bus to take us to the tram terminal for the peak.The queue for the tram was massive as dusk is the most popular time to view the harbour from the top.To speed things up we opted for the fast ticket which included a queue jump for the tram and entry to Madame Tussauds.The tram ride was very steep and in fact pretty scary. The peak is actually a viewing tower onto of a modern shopping centre.The escalators take you the 9 floors to the top, Wayne chickened out on the 7th floor and ended up playing computer golf in one of the shops while I took in the view and snapped away with the camera. The view was spectacular and I managed to see the skyline as many of the buildings lit up.Madame Tussauds was good too it is the first one I have been to and we had our pictures taken with, Elvis, Marilyn Monroe, Einstein and David Beckham.We got a taxi down to the ferry as there was no exit fast pass.We stopped for dinner in quite an expensive seafood restaurant, which changed us for peanuts and fruit salad that we did not order but they gave us anyway as part of their tactic for making us spend more. Day 5 - We took the metro to Disneyland which again is on Lantau Island.The metro is the cleanest and most modern we have ever been on, it puts the underground to shame!The platforms have doors which open with the train doors once it has safely stopped, I suppose this stops suicides and keeps the service running more effectively.We had to change a couple of times but it was all so straightforward and quick.I think we were both quite excited about going there our expectations were pretty high!Our first ride was space mountain a rollercoaster in the dark and then we were off on a moving buzz lightyear computer game - I lost I am just too slow at shooting things!! !I soon realised that the park was not that big and some of the key rides were missing. Cinderella's castle was a 1/3 the size of the Orlando one - gutted!Saying that we saw 2 excellent shows one was a 3D Mickey Mouse one and the other was a live scaled down performance of the Lion King. There were also 2 Disney parades which were fantastic, one was a typical parade to music and the other was a special summer show which was full of water and we got soaked, which was a welcome relief from the heat.After a trip on the railroad and a look at the Disney history we decided that it was too much waiting around for the firework show so we headed back to the metro.Our evening was very quiet and we headed to a small restaurant for a set meal, which was one of the nicest we have had here and really cheap.On the way home Wayne let me buy some hair straightners - think he's fed up of the fuzz!!! Day 6 - I woke with a sinking cold, air-conditioning is not good for you. It was pretty late so we had a jacket potato for lunch, something we have missed and decided to have a lazy day.We got the metro to a district in Kowloon called Mongkok, according to the shopping guide this is the place to buy genuine electrical equipment.We finally found the computer centre after asking numerous people, every street looks the same.We stopped in a lot of stores and got differing prices for the same laptops.We finally found one with a webcam, carry case, extra memory and Windows Vista for under £300 so we decided there and then that it was a good idea, even though it is extra to carry.We have already spent a lot on using the internet and WIFI has been everywhere so we will definitely get our money's worth, but probably a lot of arguments about whose turn next! !That evening we took a walk up to Temple Street Night market and wandered around the stalls, which were all selling the same souvenirs, although Wayne managed to get 2 pair of sunglasses for a good price, he needed them as he had already broken 2 pairs in 4 weeks!There were plenty of street kitchens serving food, but there were no spaces to eat as I was not feeling great we took to a small diner serving set meals again pretty good value for the amount of food. Day 7 - We took the star ferry to central where we walked through a mall to the bus station.The express bus took us to Stanley, which is on the south of Hong Kong Island.We passed 2 lovely looking beaches, Discovery Bay and Repulse Bay, but we didn't bring our swimming stuff how stupid!We got off the bus and had a walk around Stanley Market and picked up a brilliant pressie for Mark & Kelly's new dog! !On the waterfront there were plenty of bars and restaurants and we stopped for a beer and a bit of sky news!Then on to the Maritime Museum, which was housed in a building taken down in central and rebuilt but the water in Stanley.The museum was really good and had games, really for the kids understanding but good to play.The view from outside was another good one and there are just so many Islands around I really didn't expect there to be any and there are boats everywhere.We took another bus back to the ferry and this time went over the hill instead of through it and there was more views to take in.That evening we went on an hour harbour cruise and saw all the buildings light up again it was really relaxing.At the end we took a stroll along the walk of fame and saw Bruce Lee. Can't believe this is such a long entry hope you are not bored with them? 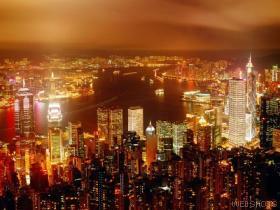 - Hong Kong has everything and we will definitely come back as there is still loads more to see!